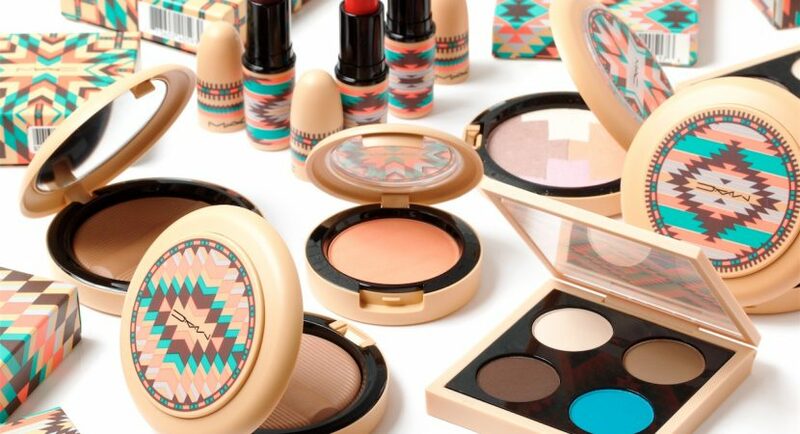 MAC created extraordinary cosmetic collection for all lovers of colourful make-up. In the collection we will find: lipsticks, lip liners, blusher, make-up base, eye shadows, eyeliner, bronzer, nail polishes and cosmetic accessories (brushes and cosmetic bags). And all of that in electrifying and energetic colours and packagings in decorative Indian patterns. Eye shadows Call of the Canyon and Wild Horses are locked in small palettes. Inside of each of them you can find four shades: shimmering écru, golden, coral and tangerine orange in the first one and strawberry, beige, brown and coffee in the second one. Shades fit perfectly this year’s trends. It can be used for summer and colourful eye make-up. They will highlight sun kissed skin and complement iris. For eye make-up you will also need eyeliner. MAC offers three products: peach, blue and brown. Consistency of all cosmetics is really soft. You can easily rub eyeliner on the eyelid or blend it with eye shadows. Lipsticks from MAC’s Vibe Tribe have five different and characteristic formulas. Beige lipstick with golden pigments has consistency of frosting. Matt finish can be ensured by lipstick in shade of dusky rose. Mirror gloss provides light pink lipstick. Lips become expressively red thanks to another lipstick from Vibe Tribe collection. However, plum lipstick has sateen texture. For lip make-up you will also need lip pencil. MAC has in its offer following shades: beige, sky blue, orange, red and pink. Face make-up with blusher. In Vibe Tribe you’ll find three shades: dark orange, red and coral. For the make-up to be even more attractive, use another products from the collection – highlighter and bronzer in one. Cosmetic is a combination of four shades: white, orange, pink and brown. You can also use products with an individual colour: brown, golden and light brown. Thanks to MAC, manicure is easier than ever. Helpful in that will be nail polishes in light pink and light orange colours. All products provide gloss and long lasting effect. Nail polishes don’t chip and cover nail plate evenly. In MAC collection you will also find two colourful cosmetic bags and make-up brushes, like: shader for eye shadows and four brushes for face make-up. All of them are created from natural and synthetic materials.